My friend Michelle always says "We live in a Magical Place." The magical place being Tonawanda, NY. It's about fifteen minutes north of Buffalo, in Western NY. I do enjoy it except for the depressing dreary weather we have most of the year. BUT one thing that makes me happy is cats, and North Tonawanda has a place you won't find any closer ~ a Kit-Cat Klock dealership. Just a hop, skip, and jump from my shop Cats Like Us is a spot that's been in business over 90 years, Walker Bros & Monroe Jewelers where they sell Kit-Cat Klocks. You may ask what's a Kit-Cat Klock? I'm sure you've seen them. I always called it "the Felix the Cat clock." It's a cat shaped art deco novelty clock with eyes and a tail that moves back and forth in rhythm to the ticking seconds. They come in tons of colors and have been made in the US since 1932! 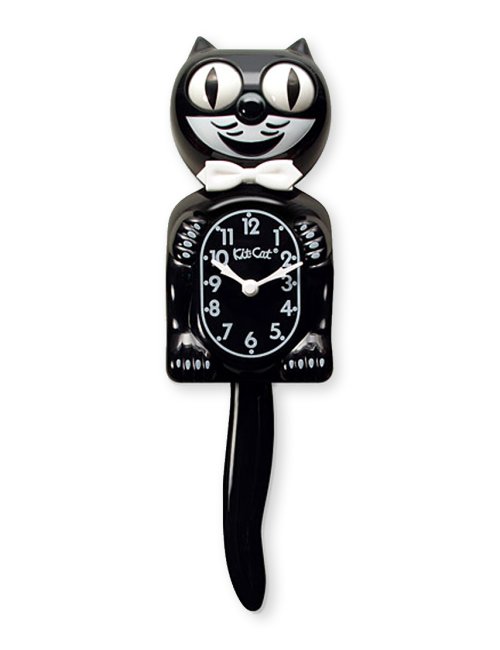 A Kit-Cat Klock is sold every 3 minutes! 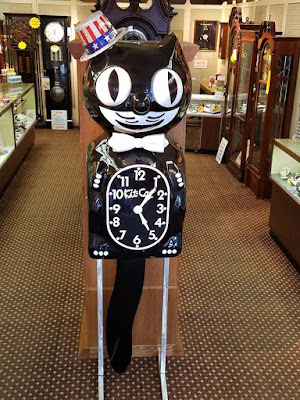 The shop down the street is such a reputable company that the largest Kit-Cat Klock in the world was on tour and stopped there last year! When I walk by Walker Bros & Monroe Jewelers I always stop and visit the Kit-Cat Klock in the window. It reminds me that I'm the youngest I'll ever be right meow, time isn't waiting, so you should have fun.